The first day of the waxing moon phase of the Chaitra month of the Telugu calendar or Chaitra sukla paksha Padyami is observed as Ugadi. Ugadi of this year will be celebrated on Saturday, 7th April 2046. 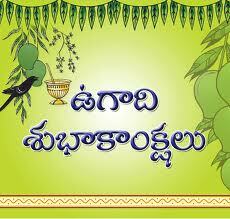 The start of the Telugu Year is celebrated as Ugadi. Eating of Ugadi Pacchadi is a mandatory in Andhra Pradesh on Ugadi. It is believed that eating of Ugadi Pacchadi on Ugadi is healthy. After eating the Ugadi Pacchadi Panchangam is read called Panchanga Sravanam. How the year is going tobe for everyone is written in Panchangam. Everyone wishes each other by saying either “Ugadi Subhakankshalu” or “Nuthana Samvatsara Subhakankshalu”. Ugadi is celebrated as Gudi Padwa, Choti Chand, Thappan etc.